Ah, Thanksgiving. The all-American holiday revolving around family, warmth, and gorging ourselves into a stupor. One factor in my deciding to go vegetarian/vegan was my desire to be able to clean my plate without feeling disgusting afterwards, and I plan to put that philosophy into full effect this holiday season! Without turkey, butter or cheese, my Thanksgiving feast is looking pretty damn wholesome and I can't wait to chow down. So go ahead, make these tarts yourself and bask in the warm glow of a happy belly and good company. 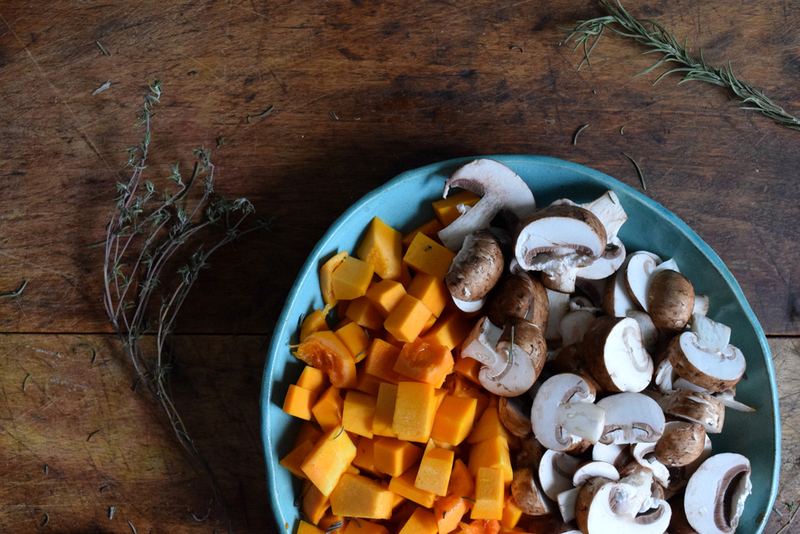 I actually made a version of this savory tart with butternut squash two years ago, as my vegetarian contribution to the family's Thanksgiving table. It was an experiment with whatever was in my mom's fridge at the time, but it turned out to be a huge hit with even the most carnivorous family members. 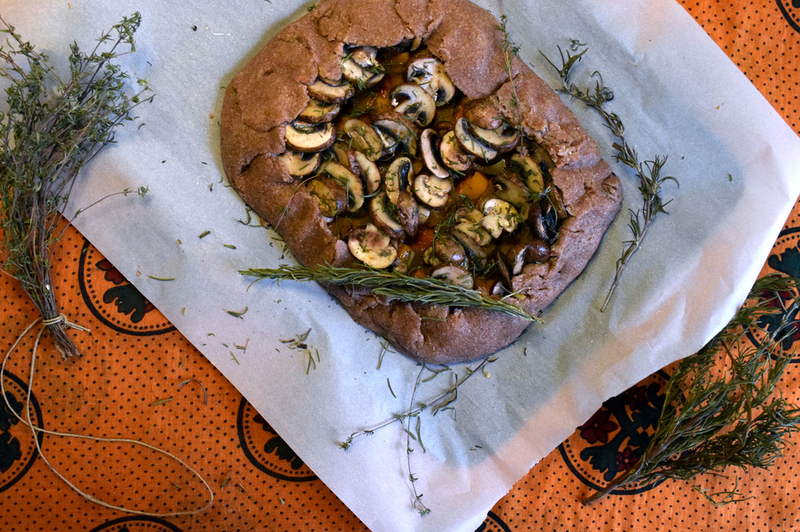 This year I decided to take things a step or two further and play with making my own, easy vegan dough in addition to a second tart of the dessert variety. Here's hoping this will wow at my Friendsgiving as much as it did two years ago! My two Thanksgiving tarts were made with 100% local, seasonal products (excluding oils) sourced from the Union Square Greenmarket in NYC. Though I'm sure that your tarts will be delicious no matter where you source your ingredients, I have to mention a few of the special ingredients that inspired me and allowed the flavors of this dish to really stand out. First, my whole wheat flour from Oak Grove Plantation in New Jersey. I bought polenta and popcorn from these folks during the summer and discovered some serious flavor. The wheat for this flour is grown and milled on their solar-powered, 38 year old, family-owned farm. My second source of flavor inspiration is the honeynut squash. The honeynut is a new variety of squash inspired by chef Dan Barber's desire for a more flavorful, less watery, butternut squash. Barber teamed up with Cornell University breeder, Michael Mazourek, to create this miniature squash with not only a concentrated flavor profile, but also a higher nutrition density than the humble butternut. This sumptuously orange, easily portable squash is currently only available in the New York and Oregon areas, so of course, upon spying it at the Farmers Market, I knew I had to incorporate this exclusive ingredient into my first North Eastern Thanksgiving feast! Last but not least, I will tell you that these two tarts have officially been taste-tested by one omnivore, two vegetarians and two vegans. The biggest complaint? That the tarts were too small! So I suggest you make a little extra dough and get thee to the kitchen so your family and friends can enjoy the savory and sweet goodness of these two Thanksgiving tarts this Thursday. It may please you to know that these beauties can be prepared a day or two beforehand and stuck in the freezer to store before baking. So enjoy! And feel free to share with me your own vegan Thanksgiving recipes in the comment section below. If your coconut oil is not already at a thick-but-not-solid state (see photo below), adjust it's temperature level. If too liquidey, place in refrigerator for a few minutes, take out and mix, then place back in the refrigerator. Continue this process until desired consistency is reached. If too solid, allow to warm up to room temperature, mixing until correct consistency is reached. Add coconut oil and incorporate with a fork until the mixture looks like course sand. Add ice water or almond milk one tbsp at a time while mixing and folding gently with a wooden spoon. Add enough liquid for the dough to form and become smooth, but not goopy. You may need to knead the dough lightly with your hands in order to warm up some of the coconut oil and help everything combine smoothly. In your mixing bowl, separate dough in half. Roll each half out individually on a lightly floured surface. You may need to roll the dough out directly onto your baking sheet as it can be too crumbly to pick up. Dough should be 1/4 inch thick when finished - you can shape it to a pie dish or whatever you'd like your tart to look like! Prep time: 30 minutes. Cook time: 30 minutes. Cut ends off honeynut squash, peel skins and remove seeds. Cut roughly into 1/2 inch cubes. Skin (save the skin for stock!) and cube onion. Slice mushrooms into 1/4 - 1/2 inch thick pieces. Heat 1 tbsp olive oil in a large skillet. When glistening, add onions. Cook for 1 minute, then add honeynut squash, salt and pepper. Cook for 3-5 minutes or until squash begins to soften. Remove from heat and set aside. In the same skillet, cook the mushroom slices until they have released most of their water, or about 3 minutes. Remove from heat and set aside. Add 2 tbsp olive oil and dried herbs to a small saucepan. Heat on low for about 2 minutes or until aromatic. Remove from heat and set aside. Brush prepared pastry dough with herbed olive oil. Arrange honeynut, onions and mushrooms as creatively or messily as you like atop the dough. Sprinkle more dried herbs on top and maybe add a dash of salt. Fold edges in to form a crust. This can be thick and flat or can be rolled into a fancier shape (just be careful of crumbly dough as you work). Brush crust with herbed olive oil. Drizzle remaining olive oil atop tart. Bake tart for 30 minutes or until vegetables are lightly crisped and crust feels firm. Remove from oven and let cool for 10 minutes before serving. Prep time: 15 minutes. Cook time: 30 minutes. 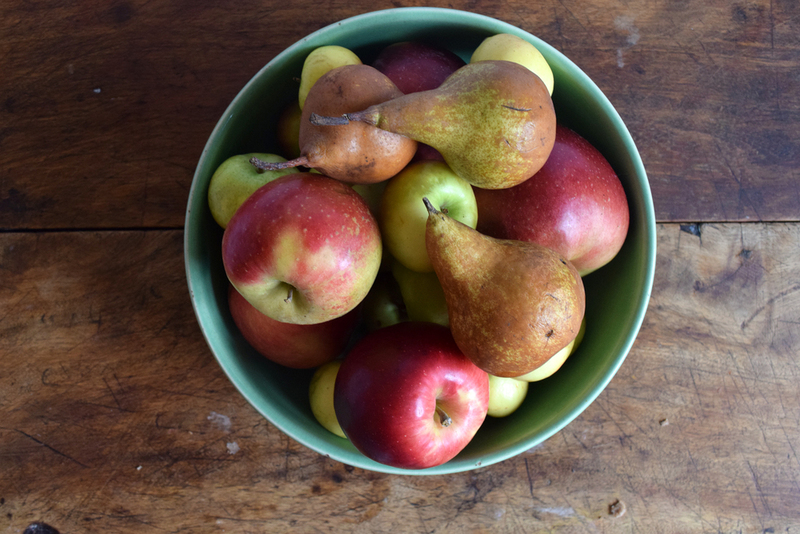 Slice apples and pears into thin, somewhat uniform slices. Set in a bowl and sprinkle with 1/2 of your cinnamon, ginger powder and sweetener. Drizzle 1 tbsp coconut oil on top and let sit for 5 minutes. Brush prepared pastry dough with coconut oil. Arrange fruit slices on top of dough in a creative pattern (or don't) so that fruit and moisture is evenly distributed across the entire tart. Fold edges in to create a crust. This can be thick and flat or can be rolled into a fancier shape (just be careful of crumbly dough as you work). 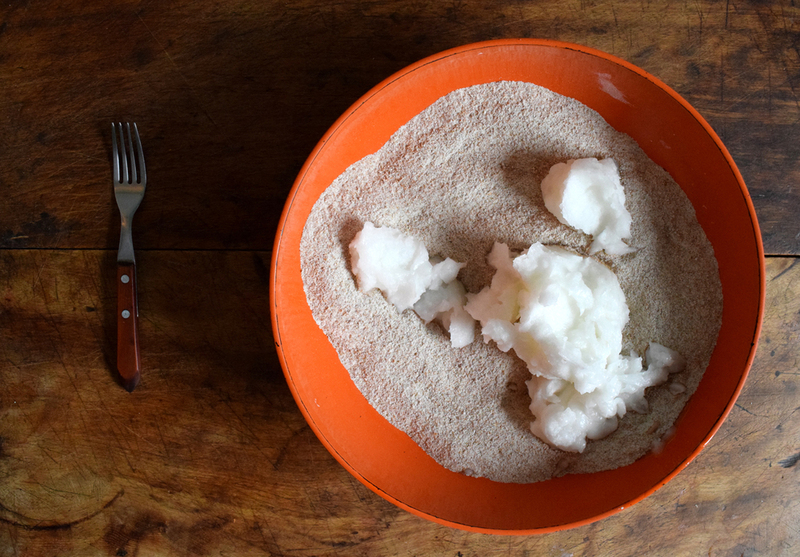 Brush crust with coconut oil. Drizzle remaining coconut oil atop tart. 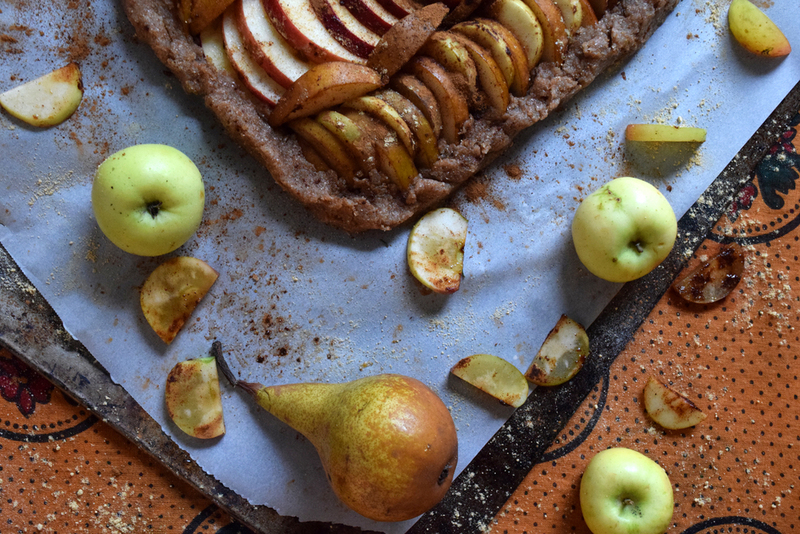 Bake tart for 30 minutes or until fruits are lightly crisped and crust feels firm. Remove from oven and let cool for 10 minutes before serving. What are your favorite vegan Thanksgiving recipes? Did you try these? How did it go over? Tell/show me in the comments below! One of my favorite things in the wintertime is a hot, steaming bowl of soup. Ever since I was a kid, my go-to sick food has always been rice in a bowl of broth; it's simple, heartening and goes down easy. Though my mom always defaulted to a can of beef or chicken broth, this vegetarian is ready for an adequate alternative. Nobody wants to sacrifice flavor and with this homemade veggie broth, you certainly won't have to. Kitchen scrap vegetable stock is full of flavor and nutrition from vegetable bits that would normally be discarded, thus stretching your food dollars that much further. My guilt at throwing vegetable scraps away is satisfyingly remedied by carefully placing every tomato stem, onion skin and carrot top in their designated freezer bag, awaiting the afternoon when they'll be transformed into a warm, salty broth. So say goodbye to overly salted boxes or cans of water that cost a precious $3 (and countless molecules of carbon in our atmosphere thanks to the processing plants and the trucks that bring those boxes to your store) and instead wave hello to an easy, house and heart warming recipe that will give you a kick all winter long. Save up veggie scraps over time, store in the freezer. When your bag is full, you're ready for a stock day! Cover and place in the oven for 20-30 minutes. If you used a baking pan, now is the time to transfer your roasted scraps into a large pot. Fill your pot or dutch oven with enough water to cover the now-roasted scraps, which should be just a bit more than the amount of liquid that will fit in your stock container. Bring the water to a boil, then cover and let simmer for at least an hour and up to two. Avoid letting it simmer for much longer than two hours as the extra time can cause the flavors to cook off, leaving you with a dully flavored stock. After simmering for 1-2 hours, take pot off the heat and let cool until you can safely touch the vegetables without burning yourself. Then, with a large bowl and colander, start to strain the stock from the scraps. You will probably have to do this in a few batches as the bowl will fill up and make a mess. Toss (or, ideally, compost) the used vegetable scraps and transfer your strained stock into its designated container. Stock will keep for 2-3 weeks if kept in a sealed container in the refrigerator. Add different seasonings to mix up your flavors depending on the type of soup you are making - I love using lemongrass to punch up the flavor for a Pho-inspired noodle soup. Though, I will often use my stock instead of water to simply cook rice or roast vegetables as it rounds out the warm flavors really nicely. What do you put in your vegetable stock? Show me what you make!